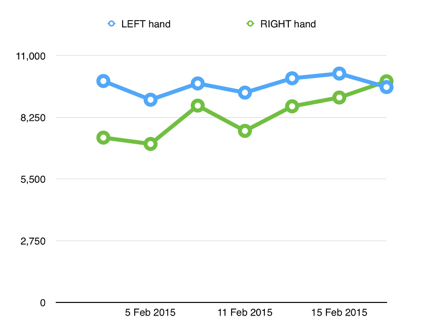 After an elbow fracture, rehabilitation is crucial to being able to get as much range of movement is possible. It is not unusually for people lose up to 10% of their grip strength as a result of an olecranon fracture. There is a gadget called a PowerBall, which is designed to do exactly the opposite, help you increase you grip strength. SO how has it fitted into my rehab immediately after the op? I suppose the first question has to be what IS a PowerBall gyroscope? A PowerBall is a gyroscope. 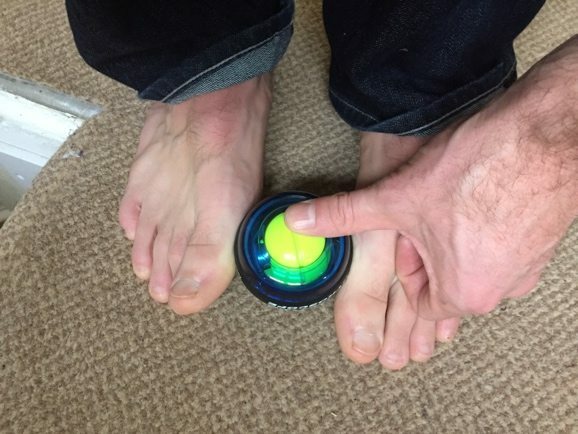 Its comprised of a central plastic ball containing a free spinning rotor, held within the hard plastic half-ball, surrounded by a rubber grip to the outside. There are magnets contained within the outer and inner balls, which when spun, work against each other, causing a force to be produced. As you know if you try to put the North end of two magnets together they will forcibly repel each other. Here, in the PowerBall, due to the enclosing plastic ball, the force produced by those magnets is turned into a spinning force or torque. As well as merely a movement force AWAY from each other, if you include a circuit in the mix, when you force those magnets together you can generate a current. Hence some Powerball’s contain LEDs, so as you spin faster, the more force is required to continue the spin, but also the more electricity is produced. The greater than spin, the brighter the LEDs shine, encouraging you on as you produce a ball of swirling light, looking for all the world like something from DragonBallZ! Other than the fact these things looks immense cool, what is a review doing here, are there any medical/rehabilitation benefits? The force produced by the PowerBall directly relates to the amount of force you initially put into it. 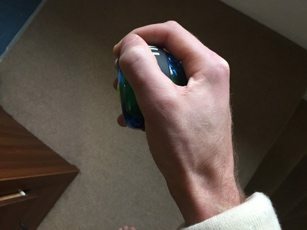 You work/used the PowerBall by turning your wrist back and forth in a pronation (turning the palm down) to supernation (turning the palm upwards) movement. The great benefit here is this motion requires recruitment of various upper arm muscles, Supinator and Biceps muscles for supination, and Pronator quadratus and Pronator teres for pronation. The harder you turn, the more the PowerBall produces inertial resistance, or “fights back”, and with that, the stronger you get. Whilst this does work to strengthen those muscles, actually performing those movements in plaster is a little challenging !. Pronation, or as far as I can get in plaster anyway! 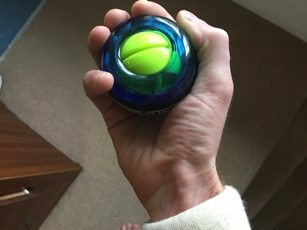 On the PowerBall website, they say that “It’s virtually impossible for any image or text to fully capture that unique feeling of holding a Powerball for the first time.” Hyperbolic, certainly, but it is fair that say that the first time using a PowerBall is an utterly alien experience. Once the ball has spun up, it fights your movements, it bucks around in your hand. It genuinely feels as though its alive and trying to break free. A very odd experience to say the least! I think the real strength here, for someone who is currently broken, is that the force produced is proportional to the power you put in. So from week 1 post olecranon fracture repair, I’ve been able to exercise and maintain some tone in the muscles of my right arm. I feel that this has really helped me get to the current stage of rehab I’m at with my arm. Most people, after ORIF (open reduction and internal fixation), will have a strength deficit of about 10% in Triceps, Biceps, and grip strength. At this stage, I don’t believe I have any deficits in grip or wrist strength, and I partially attribute that to the PowerBall. I have also been using a gripping device, but that will not affect my wrist. The PowerBall isn’t perfect, to start the inner ball spinning is either mildly difficult or a faff. It certainly requires techniques, and using it one-handed certainly worsens that! On the website they describe starting the PowerBall as “a flick of the wrist”, that’s a little like saying Atlantis as prone to flooding – a little inaccurate!! PowerBall do provide a little string that you can wrap around the inner yellow ball, to pull, and kick off the gyro, which does work very easily. The string is a real faff, however, and I guarantee, you’ll lose the string after 3 minutes of opening the box. In terms of starting the PowerBall, it’s better to say it needs to be “spun up” rather than started with a “flick of the wrist”. A flick of the wrist implies a casual, momentary movement. However, with increased use, it does get easier. Unless you have lost the string oh and have a broken arm…. In which case you end up holding with your feet, and spinning the ball a few times with your good thumb!! PowerBall do offer an “autostart” PowerBall, but there is a degree of satisfaction in being able to get it to spin up, unaided. When you used the PowerBall it feels like its fighting you, conversely, manually spinning it up feels a little like you are defeating it. One of the other great benefits of the PowerBall comes if you have the Counter on the bottom. The counter allows you to quantify your use, and track your progress. Total Revolutions – the sum total of revolutions the ball makes over however long you use it for in that session. Maximum Revolutions per Minute – the peak number of revolutions achieved during a session. Time-specific total revolutions – you can set 30, 60 or 90-second duration sessions over which to record the sum total. Personally, I have been using 90 second periods, and using that number as a marker of progress – and just to prove my geeky credentials I have even graphed my progress! 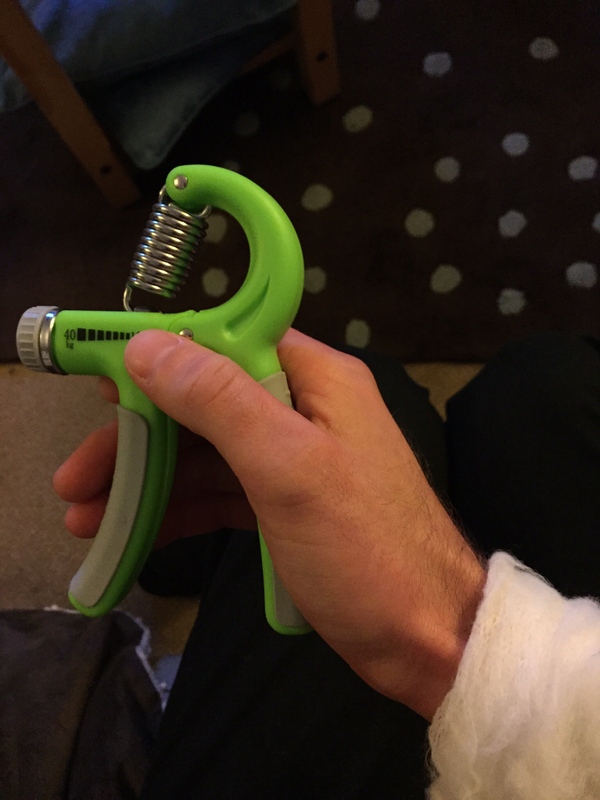 Overall the PowerBall is an excellent bit of kit, drops easily in a bag, and allows for little Physio sessions on the move – assuming you have the string. With no string, getting it going is a skill, but a skill worth learning. The range of people who may be able get benefit from a PowerBall is considerable. Once I’ve regained full use of my arm, I hope that the gyro will also help get me back holding the bars on my bike! 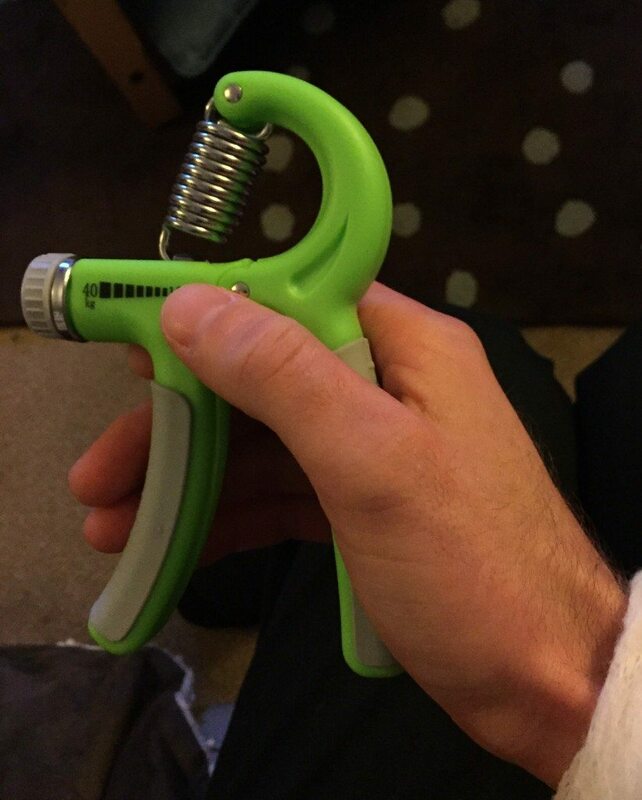 Ultimately if you have a broken arm, or hand for that matter – buy one and use it when you can/are able!